Blurb Description: When a lone soldier, Cole, arrives with news of Lachlan Agatta's death, all hope seems lost for Catarina. Her father was the world's leading geneticist, and humanity's best hope of beating a devastating virus. Then, hidden beneath Cole's genehacked enhancements she finds a message of hope: Lachlan created a vaccine. Only she can find and decrypt it, if she can unravel the clues he left for her. The closer she gets, the more she finds herself at risk from Cartaxus, a shadowy organization with a stranglehold on the world's genetic tech. But it's too late to turn back. There are three billion lives at stake, two people who can save them, and one final secret that Cat must unlock. A secret that will change everything. 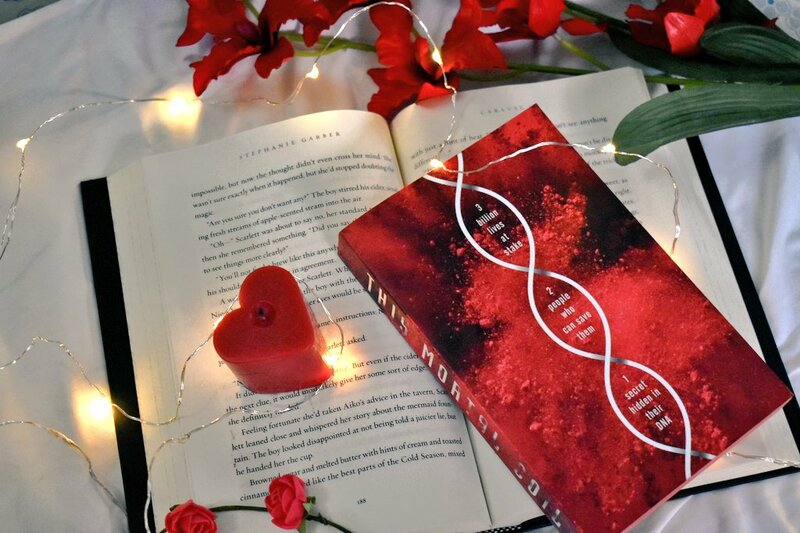 This Mortal Coil WAS AN ABSOLUTELY STUNNING, JAW DROPPING, FUTURISTIC MARVEL that I found SO hard to put down. EASILY one of the best books of 2017 and you need it in your lives. As I was unboxing my 15-Book box of mostly surprise book mail from Penguin India, all it took was one look at this ARC and I fell IN LOVE WITH IT. The sides are stained red, the cover art is GORGEOUS and I knew that whatever happened, I would be reading this book. I took it with me, one fine morning, to college when all my friends decided it would be a great day for them to skip classes. I flipped it open, because what better way to spend a day with no interruptions that inside the pages of a beautiful book and my 2017 reading year will never be the same again. 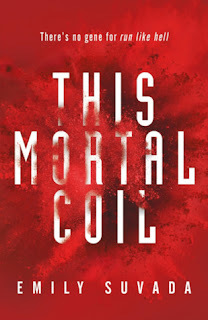 This Mortal Coil way surpassed my expectations with its AMAZING plot, perfect futuristic tech that was unlike anything I’ve ever read about before, adrenaline, brilliant characters and a well, IT WAS JUST PERFECT, OKAY? 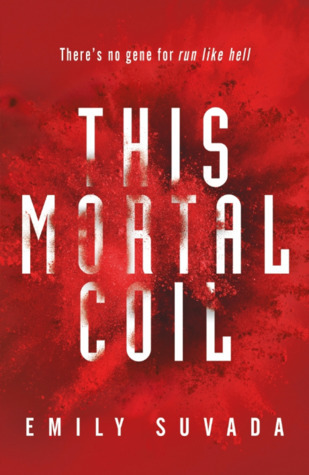 This Mortal Coil made me fall madly in love with the futuristic sci-fi genre again and please excuse me while I shove this book in your face. 1. Emily Suvada is a plotting GENIUS. This futuristic, apocalyptic world she created drew me in and I did NOT WANT THIS BOOK TO END, and I’m dying for a sequel to be announced because I need to be back in this world of biohacking and genomes and viruses and Black out soldiers and tech I haven’t even dreamed about. 2. I absolutely loved Catarina Agatta who was badass, supremely smart and yet had her human moments where she ran, cried and felt fear. I loved everything about this girl and she had some MAD skills that you need to read the book to truly understand. 3. There was this plot twist on page 401 of the ARC that LITERALLY MADE MY JAW DROP. I didn’t see it coming from any angle, and it just went to prove what an AMAZING book this debut author is sending out to the world. 4. I ADORED COLE AND CATARINA. I loved the TECHNOLOGY IN THIS BOOK and the fast pace and the adrenaline just supplemented their relationship and I loved how they fit together. I can’t wait to learn more about what his blackout training entailed and what he can do and more about Catarina herself. If me shouting in all uppercase through this review wasn’t enough for you, YOU NEED THIS BOOK IN YOUR LIFE, ON YOUR SHELVES AND MOVED TO THE TOP OF YOUR TBR. This Mortal Coil is the masterpiece from a new voice that’s going to take the Young Adult world by storm. 5 stars! 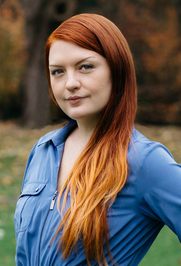 Emily Suvada was born and raised in Australia, where she went on to study mathematics and astrophysics. She previously worked as a data scientist, and still spends hours writing algorithms to perform tasks which would only take minutes to complete on her own. When not writing, she can be found hiking, cycling, and conducting chemistry experiments in her kitchen. She currently lives in Portland, OR, with her husband. Have you heard of or already had the chance to read This Mortal Coil? What do you think of it? What are some of your best 2017 books? What are some of your favourite futuristic books? Aditi is twenty, (Holy crap. How did that happen?) in her final year of college and is also working part-time as a digital marketer. She can now officially declare her favourite book of all time: S.A Chakraborty's City Of Brass. READ IT NOW AAH. Nothing at the moment. Please do check again soon. Aditi ~ •A Thousand Words A Million Books has read 18 books toward her goal of 80 books. 1) I am an associate with Amazon US, and if you buy through my blog, a small percentage of the sales will go to me. This money will be used for future giveaways. 2) I receive review copies from various sources, but my thoughts and opinions are entirely my own. I have not been given compensation in any way to write a favourable review. Share book reviews and ratings with Aditi, and even join a book club on Goodreads. Copy © 2014 A Thousand Words A Million Books. Powered by Blogger.